The readers must be wondering about the word above, while an old picture of snakes and ladders has been depicted. It is in fact snakes and ladders, but was named as mokshpatam, Parama Padam and Mokshapat by ancient Indians, as the game has its origin from India. 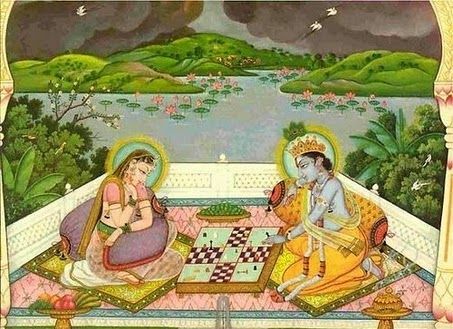 The saint Sant Gyandev created this game during the 13th century. The picture below depicts a Jain game board which was created to teach children the Hindu dharma. The ladders represent virtues and snakes represents vices, played by dices of shells. This game has undergone a lot of evolution, but the basic idea of good deeds representing heaven and bad deeds hell remains the same. Paramapadam is also another version of the same game with hundred squares. Each square is illustrated, the ladders represent the gods, and snakes; demons. Each square depicts karmas and samskaras. This game is played for the purpose of entertainment as well to teach morality. This game was renamed as ‘Snakes and Ladders’ by the British in 1892 and was modified in accordance to the Victorian values. Another famous sport that is believed to be of Indian origin is ‘Polo’. The mughal emperor Babur, is said to have founded this sport in the 15th century, which was modernized by the Britishers. The same game is played on elephants and is called as ‘Elephant Polo’, which is said to have been played by the royals, depicting the strengths of the king depending on the number of elephants. This game is played in India (Rajasthan), Nepal, Sri Lanka, Thailand, England and Scotland. Such has been the story of origins of games from India! Picture source has been citied from Aphilomath Journal, content has been reviewed from the same source.